Two chats with separate colleagues inspired this nearly two-posts-in-one. One of my colleagues pointed out we only had 3.9 questions a day on Tridion Stack Exchange (TRex). 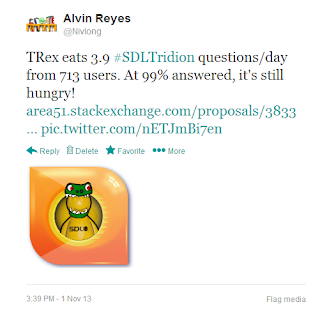 TRex eats 3.9 #SDLTridion questions/day from 713 users. At 99% answered, it's still hungry! So this post is taking me a moment to summarize and link to something, but the Tweet took a minute at most. His last point on what others find interesting is well interesting and makes a nice segue into the following surprises for my own "online following." Recently, another fellow consultant, Susan Carr, gave me some social media tips. For more pro insights, follow and engage with her on DistilledMessage. One tip was to analyze keywords for my blog, which I admit to forgetting to review regularly. Most surprising: what I think my blog is about isn't what readers are finding me by. "in tridion what is the purpose of creating empty parent publication?" Make a link in a Tridion component's RTF by placing a cursor in the rich text field. Select the hyperlink icon that looks like a chain under the insert tab. You can then choose the type, choose a url (if not a component link), add a title (which appears as a tooltip in some browsers), and the target which controls how the window pops-up.In Tridion you can only add children publications. The empty parent publication is simply a "hook" for scalability. If at some point you want a completely separate branch of publications, you'll add a new schema publication under the empty parent. The empty parent can help with removing publications (which always need at least one parent) as well. The name is rather confusing, but feel free to call it something like "scalability parent," "primary publication," or something that makes sense. You can also hide it from most users through scope (authorization) settings. Oh and Alexa's traffic stats for my blog point out "sdl tridion parent" could be a search phrase I might be interested in. When I figure out if that means BluePrinting or "parent" company, I'll let you know. Users and content management organizations are looking for interesting and seemingly simple topics. A high bounce rate isn't bad for a blog. Users will take a quick look, skim and read what matters, and then move on. So now I can continue to share, guilt- and worry-free, that my posts don't keep the same attention as say, an online store. Maybe I'll even stop competing for page views with yet another Tridion blog, and go back to focusing on the right reasons. Social media might be challenging for "traditional" marketeers, where the social point is about sharing, connecting, and being authentic over selling products. It's an odd paradox where you do better by caring less. My original reasons for sharing were the range of emotions that came with purchasing an enterprise CMS in a previous role. I had many questions and the Tridion technical community helped me plenty of times. At some point I was able to give back and haven't stopped since. Now, maybe I can take my own content strategy advice and look at the practical things my "readers" are looking for. I'll still make cheeky contributions in the name of community (and/or Halloween) and dive deep into techno-functional topics, but it helps knowing sometimes someone just needs to know where to click. For the technicals and would-be Tridion bloggers out there, you should be looking to click Publish or Ask a Question. Know when to go for the tough subjects, but be practical with what people really need (how to insert an image in Tridion). I am still learning Tridion through your posts and answers, but also from your questions. If you're already sharing, convince the next person. And if you've done that, convince someone else that they have a compelling story. I'm getting expert blogging advice and clever insight that 99% answered isn't necessarily a good thing. But this shouldn't be limited to me, others need to hear this stuff too.